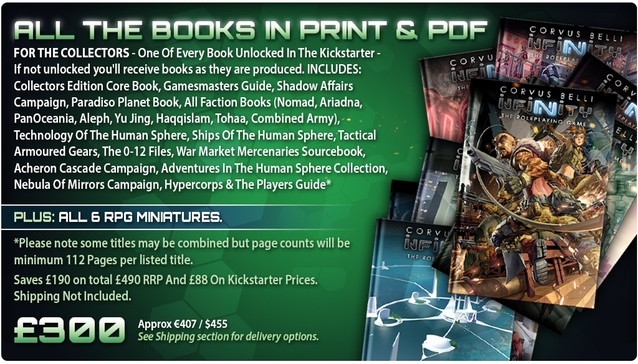 The Kickstarter campaign for the Infinity RPG that's being created by Modiphius for Corvus Belli just keeps rolling along. The campaign still has 30 days and yet they're closing in on 6x funded (if they've not already made it by the time you're reading this). There's still plenty of new things showing up, including some new pledge levels for people who want a bit of everything. The new "mega"-pledge level is £300 and gives you all the books in both hardcover and .pdf. There's... a lot of books that are part of it. If they don't manage to unlock some (though they don't see that as an issue with how the campaign's started off), you'll still get them when they're eventually released. And if more books are unlocked than are listed now, you'll get those, too. You also get all 6 of the RPG minis. The other new pledge level gets you the faction guide of the faction of your choice, one RPG mini, and the player's handbook in .pdf. So, not as crazy at the other pledge level, but also not £300.